Pet Adoption | The Humane Society and Adoption Center of Rockport/Fulton: "Twix Will Melt Your Heart!" 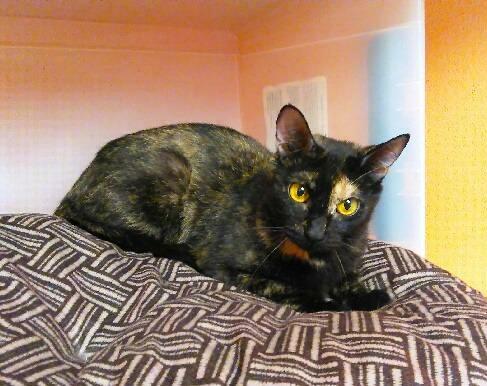 This luscious little bit of a kitty cat is Twix, so called due to her fur coloring; a blend of those smooth chocolaty browns, the golden orange of caramel and the creamy tan cookie base, which all combine into one delicious treat! Twix entered the shelter along with her kittens (Heath, Clark & Zag are still available) in March and we’ve determined that she’s about 3 years old, but at only about 7 lbs, she’s not much more than a morsel. This petite mouthful of yumminess is so sweet, she’ll make your teeth hurt, but you won’t get any painful cavities by loving her, she’s all about satisfying your need for affection with no hurtful consequences. Candy bar lovers will be interested to know that the Mars, Inc. product was first produced in the United Kingdom in 1967, but didn’t get to the US until 1979. As the confection has it’s origins where sweets are often called “biscuits”, the name Twix is a portmanteau of twin biscuits, or ‘twin bix’. Now, speaking of biscuits, Kitty Twix is an expert at making them, both paws go about it so tenderly, stretching and kneading, tenderly making the world know how pleased she is with life. And then there’s the roll onto her back to make sure that your hand is scratching just the right place behind her ear. With her honeyed purr machine going, doing a leg wind, she has no qualms about making her appreciation of human attention known. In any language, Miss Twix will satisfy just about any sweet tooth or craving. She’s spayed (no more babies for her! ), UTD and ready for your lap! Oh, and did I mention that during the month of June, cat adoptions are just $10?!?!! !